Blue vervain, which is only blue in the shade and pink when viewed in the sun, is one of the odder perennials I feel I took a chance with this year. I bought them at Prairie Nursery which I actually like, I love their selection of plants, and will be buying from them again. However, take a look at the picture they have for this plant CLICK HERE. That is almost false advertising. They have purple plants, probably more Verbena hastata, adding color to the background. When you look at my picture though you see it for what it is. 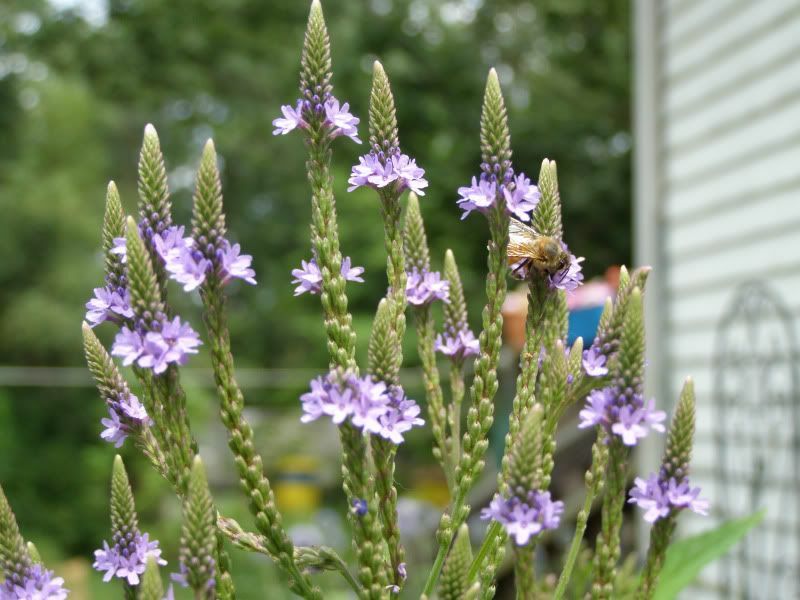 A tall, 6 foot, plant with short lived purple flowers slowly reaching up. It's not impressive in any way. I enjoy it though becasue the bees are all over it! But I have to say it's not a focal point by any means. It needs a companion of some sort. And finding something 6 feet tall with a complimentary color that blooms at the same time might be tricky. Maybe a Hyssop or Joe Pye Weed? But Joe Pye Weed is a focus point in itself that doesn't need a companion. Just a gardening issue I haven't solved yet.